Both these motorcycles make 18 per cent more power than the ones they replace. At INTERMOT, Triumph took the wraps off the 2019 Street Twin and the Street Scrambler. The UK based bike maker has now announced that they will officially launch it in India on 14th November. Since its launch in 2015, the Street Twin never received a substantial update, at least until now. The biggest talking point of this 2019 iteration is the additional power of its motor. While the motorcycle will continue to sport the same 900cc parallel-twin motor, it will now push out 63bhp – 9 horses more than before. Torque rating remains the same at 76Nm. To improve performance further, Triumph has made extensive use of light-weight materials like magnesium for the engine covers. The clutch casing, crankshaft and balancer shafts are lighter too. The engine will continue to be paired with a 6-speed transmission. In terms of engine specifications, the Street Scrambler will sport the same changes as the Street Twin. Aside from the updated engine, the Street Twin also gets minor cosmetic updates. There is a new logo on the tank and the side panels have been reshaped marginally. Also, it now sits on a new set of alloy wheels. Braking duties on the previous model were performed by a 310mm front disc with a two-piston Nissin calliper. The new version, though, comes fitted with Brembo four-piston units up front. The 2019 Street Twin will also get a smaller 220mm, replacing the earlier 255mm setup. ABS will be offered as standard. 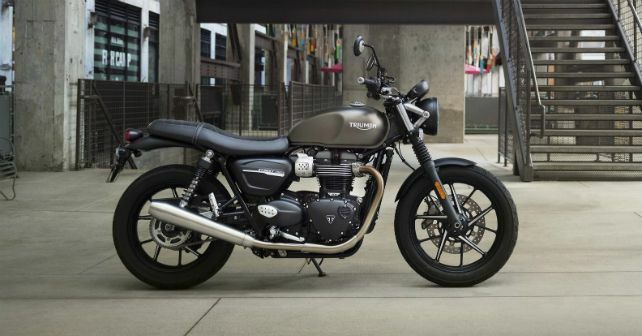 Changes to the 2019 Street Twin and Street Scrambler are likely to demand a premium of about Rs 50,000. With the current model priced at Rs 7.7 lakh, expect this updated version to carry a sticker price of about Rs 8.2 lakh. Curious to know more about the upcoming motorcycles in this price range? Follow the link for more information.